The UCSF Archives were formally established in 1963 when UC President Clark Kerr mandated the creation of both a records management and an archives program in the University. 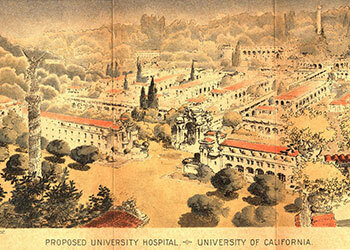 The University Archives serve as the official repository for the preservation of selected records, printed and born-digital materials, and memorabilia generated by or about UCSF, including all four schools, the Graduate Division, and the UCSF Medical Center. Archival collections document the administrative functions and responsibilities of the University of California, San Francisco. Administrative Records offer the most direct evidence of activities, decisions, and policy-making in an institutional setting. Examples of such records include Chancellor’s Office Administrative Records, UCSF Anatomy Department Records, UCSF Center for AIDS Prevention Studies (CAPS) Records, UCSF School of Medicine – Class of 1953 Collection. View UCSF University Archives finding aids online. UCSF Archives actively crawls and collects websites of internal departments and offices as well as outside organizations, groups, and individuals whose records contribute to educational and research programs of the University. These sites document the public face of UCSF and the way the University communicates its mission and its work. Learn more about web archiving, or request capture of your site.